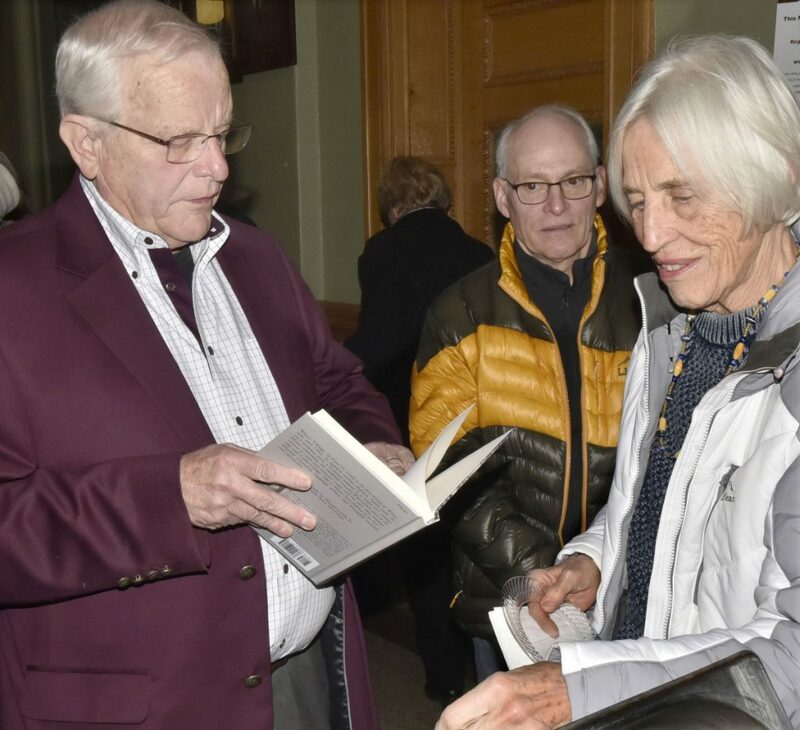 Author and historian Earl H. Smith talked about the city's history, including its immigrants, at the launch of "Water Village, The Story of Waterville, Maine." 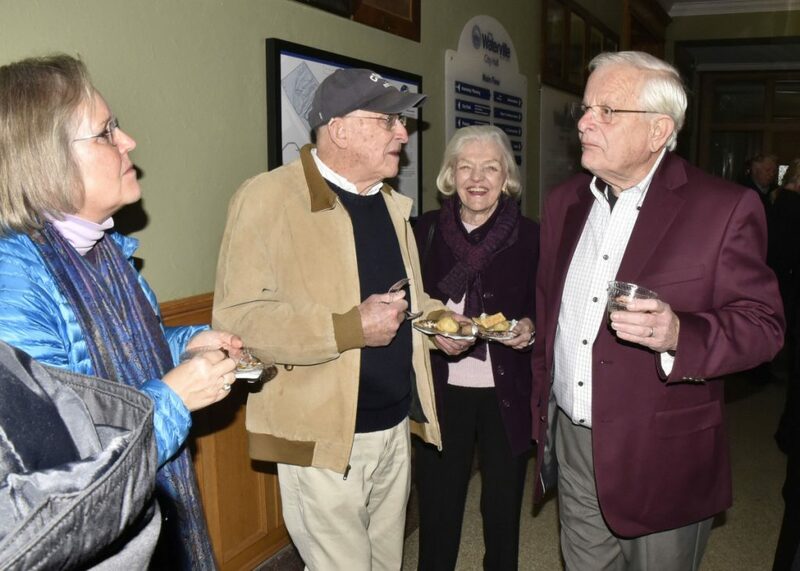 WATERVILLE — Earl H. Smith stood before an audience of more than 200 in the Waterville Opera House, where he said there was no place more perfect to celebrate the city’s history. When the Opera House was dedicated 116 years ago this past spring, one of the people who sat on the stage was the Rev. Edward Carey Whittemore, pastor of the First Baptist Church, who compiled the first history of Waterville, according to Smith. Smith told the story Thursday night on the Opera House stage during the launch of his book “Water Village, The Story of Waterville, Maine,” which is the second comprehensive history of Waterville, this one commissioned by the Mid-Maine Chamber of Commerce. Published by North County Press, the 213-page history mentions the opera house numerous times. “If these walls could talk,” Smith said. Smith spoke Thursday of the rich history of the opera house, noting that in 1907, the orator and statesman William Jennings Bryan stood on the stage to address a crowd. Ten years later, in February 1917, former U.S. President William Howard Taft was there, talking about the need to prepare for war; and two months later, the U.S. declared war on Germany. In the 1920s and ’30s, well-known Vaudeville actors performed on the stage and silent movies were shown, accompanied on piano by Blanche Letourneau Dubord. Dubord married attorney F. Harold Dubord, who would become Waterville’s first ethnically French mayor in 1928 and later serve on the Maine Supreme Judicial Court, according to Smith. He described a visit to Waterville by Franklin Delano Roosevelt, then a 38-year-old secretary of the Navy, who stood on the steps of City Hall to give a campaign speech as the Democratic candidate for vice president. And in September 1930, more than 1,000 people filled the opera house to vote to pledge $100,000 to keep Colby College in Waterville. On the Sunday after Roosevelt’s death in 1945, his portrait was placed on an easel on the opera house stage for a memorial service that lasted two hours, according to Smith. “Seven months later, citizens came right here again to cheer as Mayor Dubord presented the deed to Mayflower Hill to Colby President Frank Johnson,” he said. 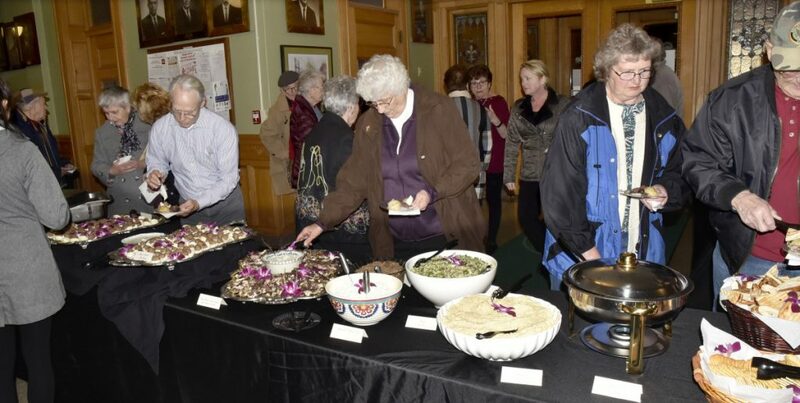 On Thursday, Waterville area residents, city and state officials and friends of Smith gathered in the lobby of City Hall before his talk to enjoy a reception that included Lebanese, French and Jewish foods to reflect Waterville’s rich cultural history. Later, Smith talked about the poignant impressions he had while writing his book. He said he was amazed by “newly discovering what an incredible city” Waterville was at the turn of the 20th century, when the Board of Trade, which later became the Chamber of Commerce, declared the city the most beautiful city. Thousands worked along the river in mills that produced cotton, wool, paper, clothing, stoves and other iron work. Two dozen factories along Messalonskee Stream made axes, scythes and wood products. The city center teemed with shops and restaurants, and the cobblestone streets lay under leafy canopies of graceful elm trees, he said. Mansions perched along gas-lit streets, two of which were named Gold and Silver streets to reflect the wealth of their inhabitants, Smith said. A new City Hall, the opera house, a library, a post office and a new high school were among the landmarks. “It was, by any measure, a most remarkable, thriving place, and I hope I have conveyed that magnificence in the book,” he said. Smith said he also was struck by the openness and ease with which Waterville embraced its immigrants. In the last quarter of the 19th century, he said, the city’s population was essentially white, Ango-Saxon and Protestant — mostly Baptist, he said. Amos Lockwood came to build a cotton mill in 1873, and Waterville suddenly had people from a variety of backgrounds and religions, he said. By 1910, 23 percent of the Waterville population was made up of new immigrants, he said. At the reception earlier, Stephen Collins, retired editor and communications director for Colby who worked under Smith for several years, said history comes through in Smith’s previous books, —”Head of Falls” in particular. 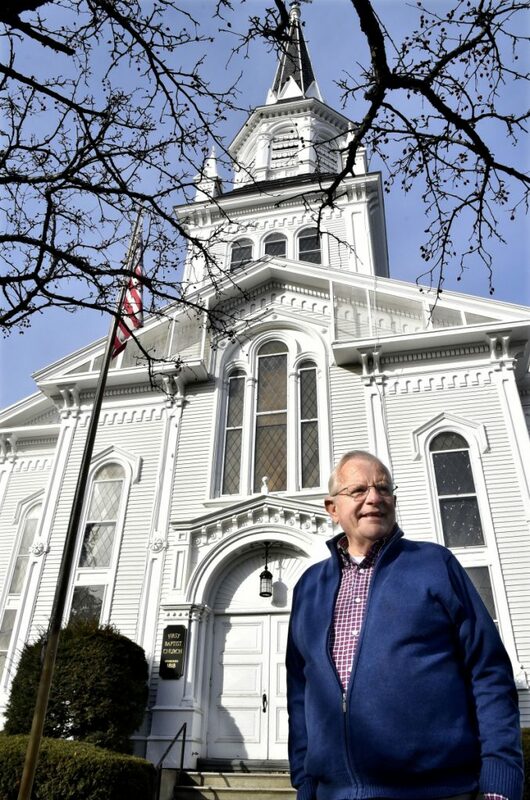 “It is extraordinary to have somebody with both Earl’s roots in Waterville and his decades of service at Colby who writes so well and has such a great sense of humor to record the history of the city,” Collins said. Rep. Thomas R.W. Longstaff, D-Waterville, said he has known Smith for decades. “He’s a great human being and author whose works really captivate you and make the towns and villages of the area come alive,” he said. Smith’s history is available at the Chamber of Commerce office on Elm Street, the Children’s Book Cellar downtown and Common Street Arts Holiday Bazaar at the Hathaway Creative Center on Water Street. Introducing Smith on Thursday night was Dan Dubord, a Waterville attorney, the son of former Mayor Albert Bernier and brother to David Bernier, also a former mayor. Chamber President and Chief Executive Officer Kimberly N. Lindlof, whose idea it was for Smith to write the book, said it might surprise people. She said half of her adult life has been dedicated to the chamber, first as marketing assistant, then as a board member and, more recently, as chamber president the last 17 years.